If you are adventurous, a paddle board (SUP) is all you need to make your time in the sea memorable. The current land scape offers a plethora of choices for a new board. There is, what we call a traditional board, which is a long, hard board ranging from 6 to 12 feet that sometimes can be a bit heavy to carry. Then we have inflatables, unlike traditional boards, an inflatable paddle board provides one with the comfort and convenience they need to enjoy their time on the water. 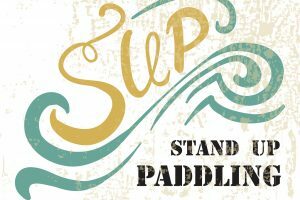 Here at Paddleboard Thrills, we bring you the best traditional and inflatable sup review(s) and advice. Check it out, now! Traditional boards tend to be faster in the water then inflatables. They also require no time to inflate.Unpack the board and your ready to jump into the water! Additionally, for long rides, a traditional board will fatigue you less as it is more rigid through the water. With that being said, if you’re paddling some white water river situations, you might consider a inflatable as rocks don’t give and can break traditional board epoxy easily. Deflated and packed in its bag, an inflatable standup board lets you bring it wherever you may want to visit. Once on site, simply inflate the board, stow your gear, and you and your family are ready for a nice day on the water. Inflatables have the stability of a normal boat and an amazing speed for both experienced paddlers and novices. It is also easy to control and it is well trimmed to maneuver through rugged water to get you to your destination safely. While inflatable stand up paddle boards are common for water sports, you can also get one for your family. It is a great addition to your family vacation and the entire family can get some relaxing, but challenging exercise. Inflatable SUPs come in a wide variety of designs, colors and materials. They are also various brands of these boards. Therefore, finding the right one can be challenging if you do not know what you are looking for. Besides, at a time when everybody is shopping online, it is logical to be confused, owing to the unlimited choices. 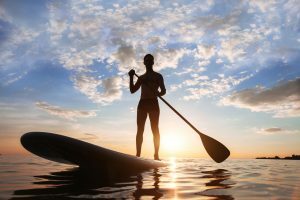 Understanding the most important features of a paddle board (traditional or inflatable boards) and their benefits can help you find the best paddle board for your lifestyle. 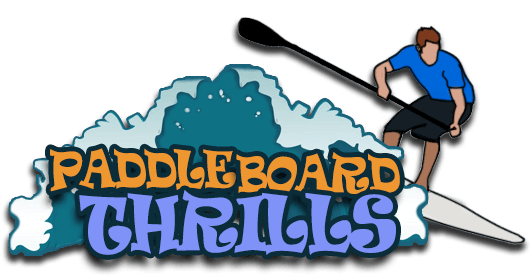 Read on for best stand up paddle board reviews! 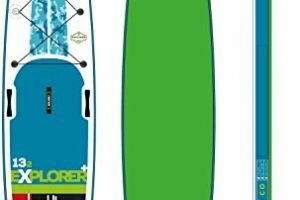 Out of all of the boards on this page, our favorite is the PathFinder Inflatable SUP. It is a perfect all-around SUP that is great for the family, all while not breaking the bank. While we love out traditional boards, we do find inflatables the best option for our beginner paddle boarders. The most striking feature and advantage of the inflatable stand up paddle boards is the fact that they can be inflated and packed when they are not in use. This means that you can move with your paddle board wherever you want to. When packaged, it can fit perfectly into your car trunk. No worrying about space, securing the board to your car, or any of the other inconvenience a hard body provides. You can also take it with you on your flight. Utter convenience! You do not have to leave it at the shore. On the contrary, you can carry it back to your villa. An inflatable SUP is light in weight. You should not have to call for assistance when you are transporting it to the water. Actually, you can carry it with one arm. Due to this important feature, you can take your paddle board to any place in the world. You can enjoy paddling in your local oceanfront or wherever your heart desires. While the inflatable SUP is made from a cloth material when it is inflated, it is quite rigid. This feature alone enhances their performance. Besides, it improves its buoyancy and prevents the SUP from giving in to pressure from various factors. However, the inside is very soft to ensure comfort. 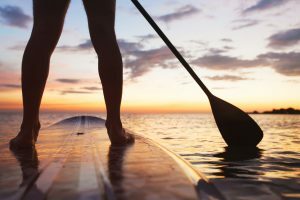 Usually, the material used to make the standup paddle board allows stretching while remaining strong and durable. Their durability is unmatched amid their lightness. Inflatable paddle boards do not damage easily and lasts long. If the inflatable board is maintained well, it can last you for a long time. The material is suited for water environments. Therefore, it lasts long. This saves you on cost. 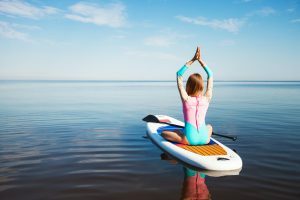 However, the paddle board will last based on a number of factors such as the material used, the frequency of use and the make. Hence, it is quintessential to choose the best inflatable paddleboard. This is because the construction and the materials used can vary among different manufacturers. One of the most important considerations you must make is the hull type. Why is it important? The hull or body of the paddle board determines its performance in the water. There are two hull types for you to choose from namely displacement and planing. The latter is suitable for anyone who would like a board that does it all and it is also able to ride on ocean waves. For beginners, these boards are striking, owing to their exemplary stability. They are also great for recreational surfing and paddling. Displacement hulls on the other hand, feature a pointed edge like the one of a canoe. The sharp edge helps the paddle board to push water to the sides of the body, improving efficiency. They are also faster. Hence, if you are looking for a speedy paddle board, a displacement hull is a great choice. However, if you just started paddling consider the planing hull first. The next thing you need to consider when you are buying a paddle board is its volume. This is often expressed in liters. It depicts the capability of a paddle board to float with the weight on it. The higher the volume the more weight the board can support. But, you should know that the size of the board does not dictate the volume. For example, a small board that is wide could still have a high volume. Therefore, a person weighing 200 pounds should look for a small but voluminous board. Another important thing you should look for is the weight capacity typically expressed in lbs. It is a critical consideration, since if you pick one that carries lesser weight than yours, you wont be able to stay on the board and risk damaging its integrity. Therefore, ensure that you have read the specifications well to ascertain the weight and volume of the paddle board. The width of a stand up paddle determines the stability of the board. Usually, paddle boards measure 36 inches in width, so that they can fit various body sizes. Wide boards (31 inches and more) are more stable as compared to narrow boards. Wider boards are easier to stand on. However, they are slower than the narrow paddle boards. Narrow SUPs are less stable naturally. 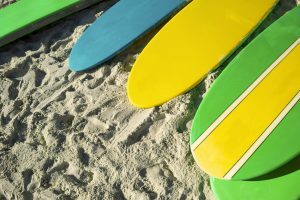 Be sure to consider the width of the paddle board you are planning to buy. Next is paddleboard length. When you are considering the length of the board, think about the area that you want to paddle. For instance, if you are thinking about riding on fierce ocean waves, you will require a longer board. You might also consider the length of your board, based on the storage space you have in your car and in your home. Besides, you might also want to consider the distance you have to take before reaching the beach. This is why we recommend inflating your board right before entry. Makes carrying the board to the edge of the water a lot easier. Long boards tend to be swayed by the wind when you are carrying them. Short boards measure less than 9 feet and are suited for surfing. For the little ones, boards of 8 feet length are perfect. Medium boards (9 feet to 10 feet) are useful for all applications. Longer boards are suitable for touring, racing, and gliding. They are also faster than shorter boards. In addition, you need to consider the materials of the paddle board you are buying. The material had a large impact into the function of the paddle-board. A common material in conventional boards is EPS foam. This is created from combining foam and fiberglass. Usually, most conventional boards are made of this material. Its interiors are made from plastic and carbon fiber. Some conventional stand up paddle-boards have hollow cores to decrease their weight and to enhance their performance. Then, there is polyurethane foam. It is stronger than EPS foam. This material is mainly used in beginner boards. However, most modern inflatable stand up paddle-boards, on the other hand, feature PVC exteriors with drop-stitch construction that create an air core. Inflatable boards are very durable, light to carry and easy to store. 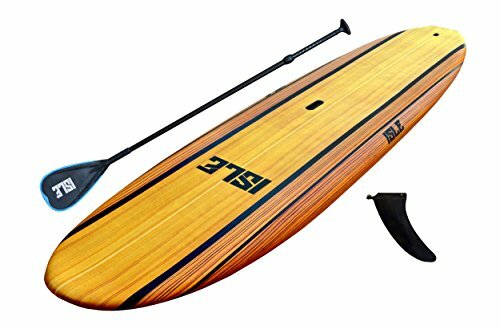 Starting with our first traditional board is the ISLE Soft Top Stand Up Paddle Board Package (5” Thick), it a great board for beginners and intermediate paddlers. It comes with a wide range of features including adjustable paddle, center fin, center carry handle and non-slip deck grip. It measures 9 feet 6 inches and 10 feet 8 inches in lengths. This shows that it can be used for recreational surfing. The bottom of the board is made of polyethylene material, to give it a shiny appearance and a firm grip to ensure safety. It also has a core made of EPS and the core is laminated in wood stringer. This paddle board is able to carry people who weigh up to 275 pounds. Apart from its features, the paddle board has an attractive board. It has a nice finish that covers the board and protects it from water. But, that is not all. This board also has a tacky surface to keep you steady on top of the paddle board. For beginners and intermediate paddlers, the board provides them with an opportunity to maneuver flat waters. If you are shopping on a budget, this paddle board retails relatively cheaper. Lastly, this board is also easy to carry and has enough room to invite another passenger. Next we have the, California Board Company Stand Up Paddle Board is not an ordinary surfboard. It comes with a range of extra features, which you will not find in other boards selling at the same price. The paddle board is made of EPS foam, just like the ISLE. This ensures its strength and stability. It also lasts for a long time, allowing you to save your money. The board also features a waterproof core, making it lighter, and a surf leash. This is a bonus for those who love surfing. The California Board Company Stand up Paddle board has a padded roof rack, as well. This allows you to tie your board to any vehicle. The SUP handle is also adjustable, which enhances flexibility. This makes the board suitable for a wide range of applications. In addition, the board can carry a maximum weight of 300 pounds. The most striking feature about this paddle board is the camera mount. You can record your memories. This feature is not present in many stand up paddle boards. It is also beautifully made but also very stable. The board is long enough and it has adequate room for two people. Last but not the least, at 25 pounds, the board is light in weight. On to our inflatables, the Solstice Bali Stand-Up Paddleboard is a modern inflatable SUP. It has a sleek appearance and is light enough to carry to the water. The board is streamlined to cut through water at high speeds. 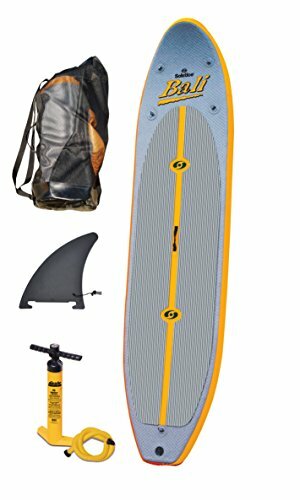 The board comes with everything you need to paddle or surf. The beauty about it is that you can pack it in your car trunk; you simply deflate it and stock it in your car. Being inflatable also makes it easier to store the board in your house. The board is made of 1000 Denier 3ply PVC material. The PVC accords it durability. It also inflates easily. The paddle board also features stainless tie downs for holding the gear. In the package, you will also find a pump, gauge, and carry bag. The pump helps you to inflate the paddle board whereas the carry bag offers safe and convenient storage. 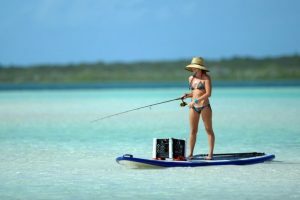 The Solstice Bali Stand-Up Paddleboard retails at the same price a solid stand up paddle board does. However, it oozes with comfort and elegance. It is also attractive. Besides, it is convenient since you can carry it to any place. You can even carry it on your back. The paddle board is also stable to support you when paddling and surfing. 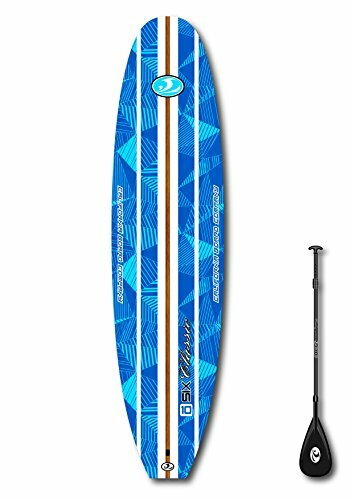 Blue Waves Sports Stingray 10 foot inflatable Stand up Paddleboard with Paddle and Hand Pump represents comfort all through the board. Measuring 10 feet in length, 30 inches in width and 4 inches in breadth, the paddle board offers ample room for one person. It carries a weight of up to 220 pounds. The exterior of the board is made of double layer material, for maximum durability. The core is multilayered to provide rigidity. The paddle board comes with a high-pressure hand pump. This is used for inflating the board to prepare it for paddling or surfing. Blue Waves Sports Stingray 10ft. Inflatable Stand up Paddleboard also has a multi-configuration. That is you can use it as a Kayak paddle, SUP paddle and canoe paddle. The board also has a carry handle, which features inbuilt stainless steel D rings. The handle has a cord, to ensure easy storage. The floor of the deck is heavily padded for comfort. It is also made using Soft Grip Technology that offers firm grip to prevent slipping. In the package, there is a paddle/blade, hand pump, removable fabric seat, center fin, repair kit and a polyethylene storage bag. At its retailing price, this inflatable stand up board offers value, comfort, convenience and exemplary performance. 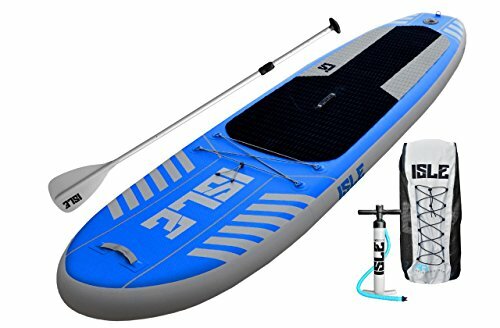 ISLE Airtech 10’ Inflatable Stand Up Paddle Board is among the newest product in the line of inflatable stand up boards. The board stands out among others due to its fusion-lite construction. This feature makes it 30% lighter than other inflatable SUPs. Even with its light weight, it is stiffer and more durable. When it is completely inflated, it measures 10 feet by 30 inches by 6 inches. The paddle board is designed to handle various situations. The board can run on rivers and mild ocean waves. It is also suitable for beginner riding. It has a weight capacity of 240 pounds. There is also extra storage in the deck for carrying additional gear. When it comes to the durability of the ISLE Airtech 10’ Inflatable Stand Up Paddle Board, you need not to worry. It does not matter where you take your board, it will come out unscratched. The material used to make the board is not damaged easily. In the package, you take home a travel paddle, pump, fins, carry back pack and repair kit. Although it is rigid and strong, the paddle board weighs only 18.6 pounds. This means that you can carry it to the water and out of it, using one arm. 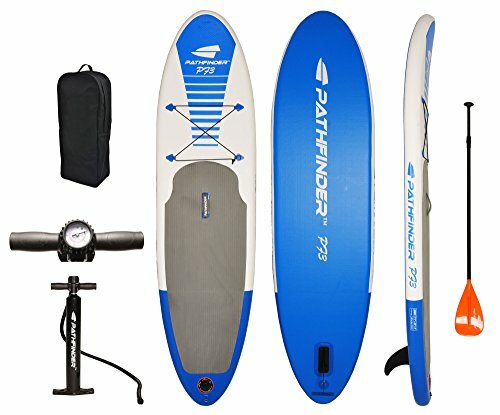 The Pathfinder Inflatable Paddle Board is a great entry budget board for beginning paddlers. Measuring 9’9″ long x 30″ wide x 5″ thick, the board is very manageable and light for its size. The Pathfinder does not compromise in ruggedness, however, and can support up to 240 lbs. The Pathfinder is also a very versatile board that is good for many conditions. 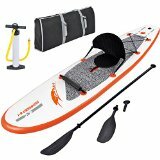 Along with the paddle board, you also receive a matching air pump, a removable center tracking fin, tie-downs, an adjustable aluminum paddle, a valve wrench for air control, and a carry bag to put everything into. The board skin itself is thick PVC, not thin puncture-style plastic. In addition, each seam and section is sealed with a multi-layer professional stitching to make sure the PVC stays together properly. If price is not an issue, we really like the ISLE Airtech 10’ Inflatable Stand Up Paddle Board. It is lighter at 18.6 pounds than most stand up paddle boards and still holds great stiffness. Our TOP Pick, however, is the PathFinder Inflatable SUP. It features and affordable price really make it a great board. It is also made of high-grade material. Besides, it is built to maneuver different water conditions, making it suitable for beginners and experienced paddlers. Then we come in at #3 with the Blue Waves Sports Stingray 10ft. Inflatable Stand Up Paddleboard. It is another contemporary inflatable stand up board, with a difference. It has a strong construction both in the interior and exterior surfaces of the paddle board. It also comes with a collapsible seat for added comfort. 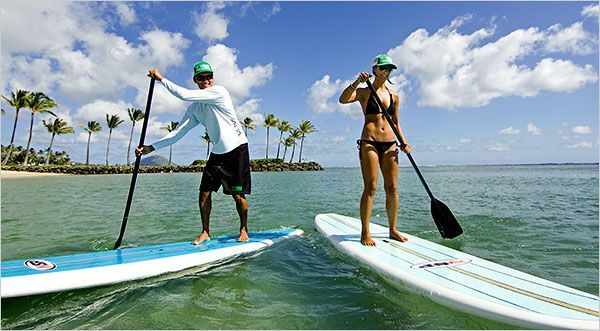 In addition, Solstice Bali Stand-Up Paddleboard is an affordable inflatable stand up board. It is made with a light but rigid material to enhance the performance of the board. It also comes with a pump and gauge together with a carry bag for storing the paddle board for easier transport. Fourth is the California Board Company Stand Up Paddle Board. It is a long board suited for cruising waters at fast speeds. It is made with a strong but light material. It is stable enough to hold you safe even during the fiercest waves. It also has a camera mount, which is not common in most paddle boards. Lastly, we have ISLE Soft Top Stand Up Paddle Board Package. It is most suitable for recreational surfing. It is long and well streamlined to help it maneuver through calm waters. The board is strong and laminated to offer it an attractive look. It is also affordable. Come back and visit often for our new and upcoming inflatable sup review(s)!